View from south west. Original photograph from the RCAHMS Society of Antiquaries Collection MS/36/209. Dun Dornaigil (OS 6"map, ) Dornadilla (A Pope 1777) or Dornagail (A Young 1964) is the ruin of a broch standing generally to a height of 6ft to 11ft externally but to 22ft on the NE, which arc contains the debris-choked entrance with its massive triangular lintel. This section has been buttressed internally in modern times. The interior measures 27ft in diameter and the wall is 8ft thick where visible above the debris filling the courtyard. Only the two outer roof-lintels of the entrance are in situ, but the remains of a guard-chamber survive on the right. An entrance to a mural chamber, or possibly the stairway, is indicated by a large lintel in the internal wall, 24ft to the left of the entrance. Immediately opposite the entrance, a small opening has exposed the top of a chamber roofed with overlapping flags. Cordiner mentions three galleries surviving within the wall in the 18th century, but, except on the NE, the wall has been reduced to the level of the floor of the first gallery. In 1874, the name was collected as 'Dun Dhoirneghil', but was 'corrected' to 'Dun Donradilla' by Rev J M Joass, Golspie. 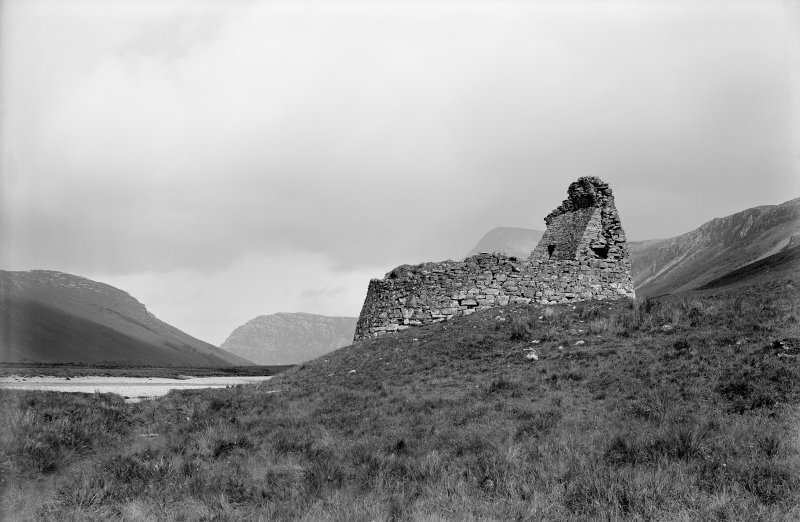 The broch is still known locally as 'Dun Dornaigil' (Information from Dr C S Sandeman, Durness) , but the 'Dornadilla' form of the name is of interest in that a 'Dornadille' appears in early king lists. A Pope 1777; C Cordiner 1780; Name Book 1874; OS 6"map, Sutherland, 2nd ed., (1908); Visited by OS (A C) 3 June 1959; A Young 1964. 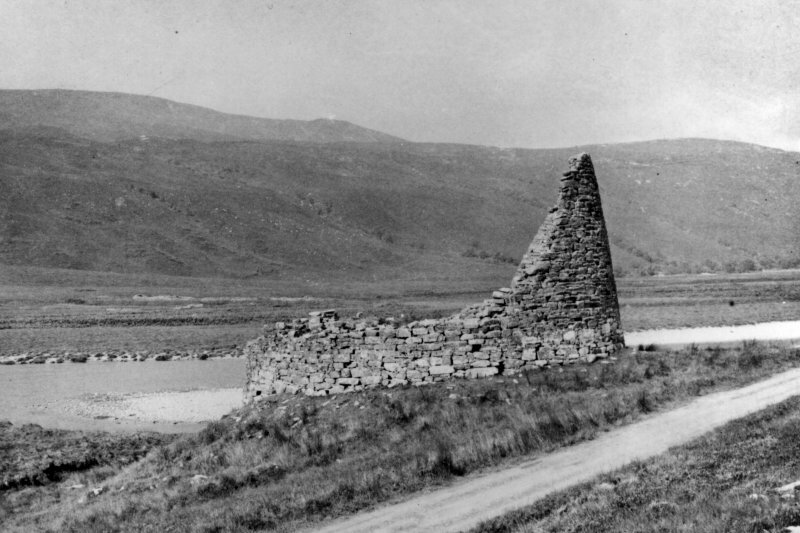 Dun Dornaigil, a broch as described by the previous authorities. Visited by OS (N K B) 9 November 1978. NC 4571 4501 As part of a research project into broch architecture and the Knowledge Transfer Project (a collaborative research project between AOC Archaeology Group and the University of Nottingham) a laser scan survey of Dun Dornadilla broch was undertaken in October 2007. Five scan positions were taken to produce a pointcloud with a net resolution of approximately 10mm. Funder: AOC Archaeology Group / University of Nottingham. 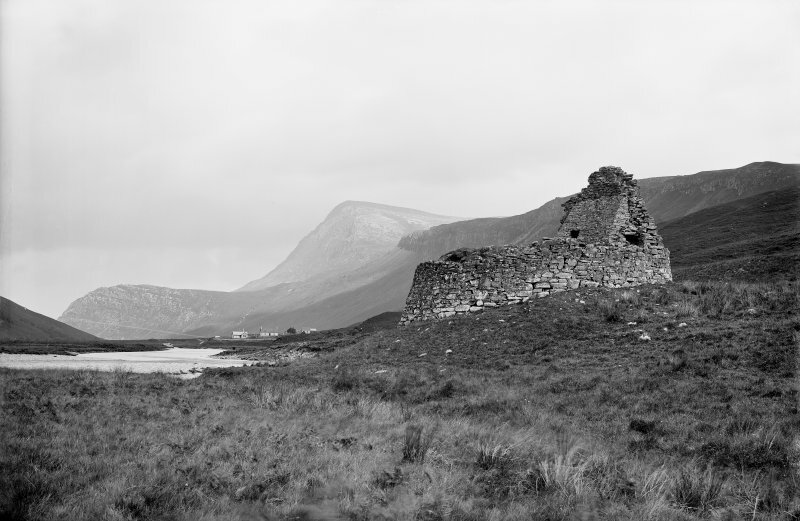 This broch in Strath Hope, Durness, Sutherland stands on the flat flood plain of the valley floor and beside the steep bank of the river Naver (visited l0/7/63 and 20/7/85). Most of the structure stands only 2.4-2.7m (8-9ft) high but the part over the entrance passage is still 6.7m (22ft) high. However the inner half of the double wall has fallen and the outer half is supported by a modern buttress against the inside. It seems that this broch was known – at least as a geographical feature – to a few scholars as early as the late 16th century. This was the time when Timothy Pont was making his (unpublished) maps of Scotland which were later incorporated into Blaeu's Atlas of 1664 [10, 11]. In the map of “Strathnavernia” Blaeu shows the river “Avon Yrredell” (now the Strathmore River) running south of “Loch Houpp” (Hope) and,in about the correct spot for Dun Dornadilla, is a small circle which usually indicates a settlement or a building. It is labelled “Stra Yrredell” and this place name, in contrast with the others nearby, also appears on the much smaller scale map of EXTIMA SCOTIAE (northern Scotland) [10, 11], suggesting that it was a conspicuous place – which a high, ruined, old tower certainly would have been. If the Pont place name does refer to the broch (which is by no means certain) it suggests that the name 'Dornaigil' (or 'Dornadilla', which sounds more anglicised) is a more recent corruption of ‘Yrredell’ (below). On the other hand 'Stra' is probably the Gaelic srath – a valley with a river running through it – even though it is written right beside the circle. 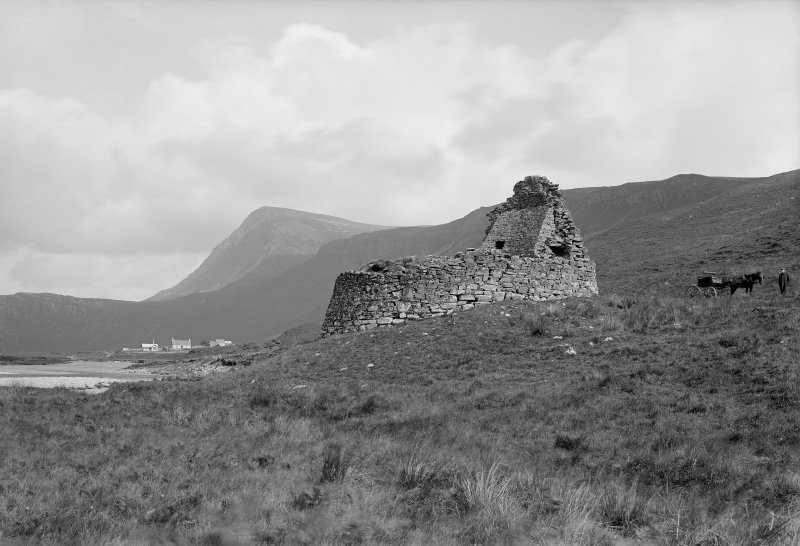 It is surely significant that the other north mainland broch which was still in a tower-like state until recently – Dun Alisaig (NH68 1) in Easter Ross – is also marked with its name on Pont’s map. "There are several of these Fabricksin the North Parts of Scotland, …. ; one near Glandunin,[ This place name has not been identified] two at Easter-Fairnin Ross-shire, and two or three in my Lord Reay's country, one of which goes by the Name of King Dornadilla's Castle. "[12, 168]. He also repeats the story, recounted in Buchanan (1582), that King Dornadilla reigned in Scotland from 260 BC. The earliest detailed description of this site seems to be that by Bishop Richard Pocockein 1760; he described the structure as "in a very tottering condition". Yet the tower seems to have been entire all the way round when he visited it, and about 30ft high in part; his comment that "The top is crowned with long even stones; it consists of two walls." suggests that part of the covering of the topmost surviving gallery was still in place. His comment that "There is a set-off within of one foot three inches . . . " may be describing a scarcement but, if so, no trace is now visible above the rubble which fills the central court (there may well have been much less rubble then if the upper parts of the broch were more complete). The drawing made for Pococke is the earliest known. The general view – also reproduced by Cordiner – shows the state of the broch in 1760 and it is clear that the inner face of the double wall still survived; the vertical series of voids described by the Bishop are also clearly seen. The part which is now only about 2m high was then much better preserved. The elevation is an attempt to restore the broch to its original condition and shows the broch double wall clearly, even though the galleries and voids are obviously schematic. Assuming that the restoration is based on the best-preserved section, three galleries were evidently preserve din 1760, with the beginnings of a fourth. Likewise the voids in the inner wallface were then extensive (though they can hardly have been so ladder-like). The shading at the bottom represents the rubble-filled base of the broch, and the possibility of a solid base was not then envisaged. This mention of Dornghiall the son of Duff contrasts sharply with another contemp-orary statement (below) that no educated local person had heard of the name . It still leaves open the question of whether Pont's 'Yrredell' is the same as 'Dornaigil' or 'Dornadilla', or indeed whether the latter is the same as 'Dornghiall'. Pope provided a longer but similar description in 1776  with one interesting additional detail. "The entry to the gal1eries was from the North side of the doorway by a stair that went to the top; but, as the stair is not entire, we cannot pretend to describe it. Doubtless it was a very rude piece of architecture." This implies that the doorway to the intra-mural stair was to be seen at about 3 or even 4 o'clock (the main entrance faces north-east) which is an unusual position. Traces of the steps of the stair should still be preserved behind the modern buttress. The anonymous 18th century author in the Edinburgh Magazine in 1795  also says that "there is some remains of an awkward stair-case", which has also vanished. This author may also be describing a scarcement ledge, though at an uncertain height. "The stones which compose these shelves are supported chiefly by the stones which form the walls, and which project all round just in that place where the shelves are, and in no other." He also seems to have been able to get into the broch by way of the entrance passage, which is now completely blocked. "The entrance is by way of a very low and narrow door, to pass through which one is obliged to stoop much; but, perhaps, the ground may have been raised since the first erection." 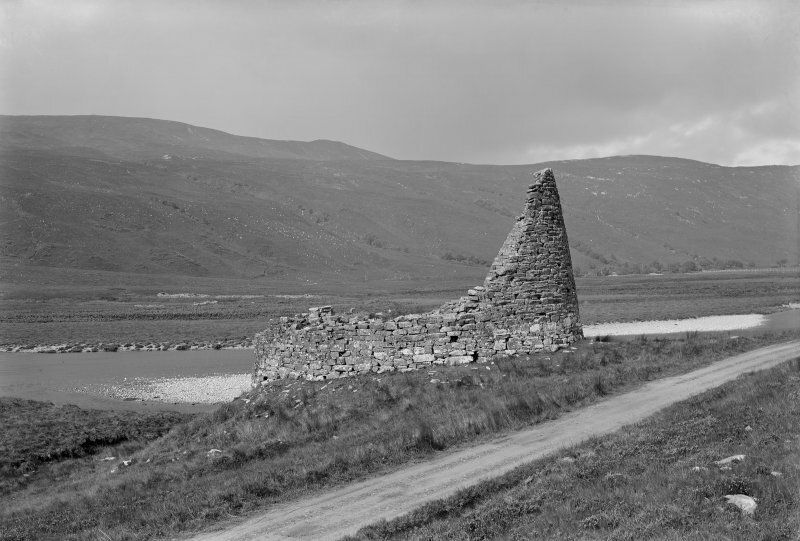 Dun Dornaigil is also of interest because its name provided the evidence for one of the earliest attempts to give an absolute date to the brochs. The Rev. J M Joass of Golspie 'corrected' the name to 'Dornadilla' (1874) ; this name appears in the early king lists of Scotland and 'King Dornadilla' was once thought to have reigned at about 260 BC [4, 340]. However one must suppose that he had read about this in Gordon's book of 1726 (above). Yet at the end of the 18th century no-one who lived locally seems to have heard of this idea. "The most learned among the inhabitants, such as the gentry and clergy, who all speak the Irish language, could give no information or tradition concerning its use, or the origin and meaning of its name." [4, 341]. This of course seems to be directly contradicted by the Rev. Pope's quotation in 1777 of a local verse about 'King Dorn-ghiall'. The relationship, if any, between the broch Dun Dornaigil, the earlier place name 'Stra Yrredell' and the legendary King Dornadilla seems rather confusing now. However a working hypothesis may be offered. In about 1580 Timothy Pont doubtless transliterated to “Stra Yrredell” the name of the broch he presumably heard from a localinformant while mapping along Loch Hope. Srath is the Gaelic word for a valley with a river running through it and, since Pont evidently got that word down accurately, it may be assumed that “Yrredell” is a reasonable effort also. One might tentatively suppose that by the time Gordon wrote about the site in 1726 someone had already read Buchanan’s work and made a connection between the King Dornadilla mentioned there and the roughly similar name “Yrredell” on the Blaeu map. Thus perhaps “Stra Yrredell” became irrevocably and wrongly converted into Dun Dornadilla, to fit with Buchanan’s historical scheme, and the best evidence for its original name was forgotten. If this is so the alleged historical link with the mythical Scottish king was a figment of someone’s imagination, probablyin the later 17th century. It is also intriguing that the ancient P-Celtic word Avon was evidently attached to “Yrredell” to denote Strath Hope. Could both names have come down from pre-Gaelic times? The interior is full of rubble up to the present low wallhead but this, and the interior, are now turfed over so that all structural details are hidden; more was visible in 1963 before the turfing. It may be assumed that the broch has a solid-based wall. No traces of a mural gallery were clearly visible on the wallhead even before the turf was laid on it but in 1963 the top of a tall, corbelled, mural cell could be seen at about 2 o'clock. The Commission also noted a probable doorway lintel at approximately 10 o'clock which may lead to the stairway, still buried. The entrance on the north-east appears to be partly intact but it is full of debris to not far below the lintels. A massive triangular lintel covers the outer end and this impressive stone measures 1.42m (4ft 8in) along the base, and 91cm (3ft) in height. One door-check remained visible on the left in 1963, 1.09m (3ft 9in) from the outside. The Commission saw signs of a guard cell on the right side of the passage. The outer wallface is built down over the lip of the river bank at one point and is sharply battered all round. Near the cell the batter, or slope, of the wallface is 90cm (3ft) in a height of 3.05- 3.66m (10-12ft), or about 1 in 3.6; it must surely have curved up more nearly to the vertical as the wall rose. The wallhead here is 2.59m (8.5ft) thick. Traces of some of the broken-off lintels of the upper galleries can still be seen at the right end of the buttress (looking outwards). They show that there were at one time at least two upper galleries although Cordiner's drawing suggests that there were once at least four. The chamber over the entrance is also pre-served. In 1963 it was accessible through an opening in the modern buttress but by 1985 this had been filled up, thus concealing a significant architectural feature. It seems possible that the intra-mural stair is partly preserved just clockwise from the buttress but – although signs of an intra-mural feature were visible here in 1963 – the area is now grassed over. In its size, proportions and surviving height (below) – and even in the way one side of the tower is built down a steep slope – Dun Dornadilla is surprisingly similar to Dun Carloway in Lewis (NB14 1). The resemblances are so strong that one wonders whether the same man was responsible for both buildings. The broch is approximately circular and the circumference at the foot of the wall on the flat ground is (by the author’s measurement) 45.45m (149ft); assuming circularity the average external diameter is therefore about 14.49m (47.5ft). If the wall is 3.51m (11.5ft) thick at the base the wall proportion should be about 48.9%. Sources: 1. NMRS site no. NC 44 NE 3: 2. Pope 1777, 216-18 and fig. : 3. Cordiner 1780, 108-10: 1795, plate (pages un-numbered): 4. Anon. In The Edinburgh Magazine, quoted in Pennant 1795, 340-41: 5. RCAHMS 1911a, 53-4, no. 155: 6. Young 1962, 184-5: 7. Feachem 1963, 173-4: 8. Pococke 1760, 121 (fig. ): 9. The Scottish Gael, 2 (1831), 16 (fig. ): 10. Stuart 1867, 298: 11. Blaeu 1967: 12. Stone 1991: 13. Gordon 1726: 14. Close-Brooks 1986, 151, no. 82.